For years, Silver Mirror has set the standard for luxury facials and peels in New York. 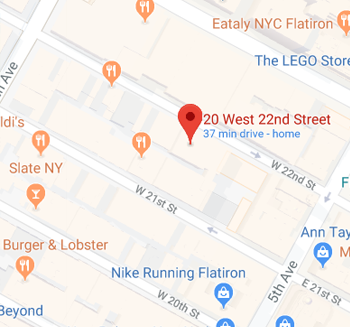 We now have a new location conveniently nestled in the Flatiron District to serve clients in Chelsea, Manhattan, NoMad, Union Square, Murray Hill, Madison Square, West Village, and other nearby Manhattan neighborhoods. Experience our cutting edge skincare technologies and the convenience of our 30-minute or 50-minute treatment times. Find all the facial treatments you need to reveal more youthful skin here at our facial bar in Flatiron. We’ll help you address your specific skin issues with our targeted facials, including our anti-aging facials, sensitive skin facials or brightening / dry skin facials. Our anti-acne facials take less than an hour to perform, but they can banish breakouts and speed up the healing of acne-related inflammation. Treat your skin more effectively with one of our many peels in Flatiron. Try the Skin Refining Peel to revive a youthful look on your face featuring dramatically reduced lines, improved texture, and revamped tone. Or target acne on a deeper level with our acne facial peels, such as the Acne Clarifying Peel. In addition to standard peels and facials, we also offer facial add-on enhancements in the Flatiron District that you won’t find anywhere else. Experience a facial perfectly-customized to your personal needs and tastes with add-ons such as, dermaplaning, extra extractions, neck care, LED therapy or other additional special touches. Want to know where our new location can be found? Here’s everything you need to find us! We’re just steps from Madison Square Park and a few blocks away from Union Square Park. Our newly-opened location is on 22nd Street, just between 5th and 6th Avenue. Find us close to the center of the block on the south side of 22nd Street. The local 23 Street Subway station is the best stop if you want to arrive as close to our door as possible by transit. This station lets out just under Madison Square Park and is only steps away from our new location. We are only steps from the Broadway Line 23 Street Subway Station, featuring the R and W subway trains, that lets you out underneath Madison Square Park. We are also two blocks from the F and M subway lines at 23rd Street and 6th Avenue. If you’re walking on the street, you can easily find Silver Mirror Flatiron between the WTHN and Toto storefronts. Other subway lines close to Silver Mirror Flatiron include the 6 train at 23rd Street and Park Avenue, the 1 train at 23rd Street and 7th Avenue, and the C and E trains at 23rd Street and 8th Avenue. Silver Mirror Flatiron is also a five-minute walk from the world famous Union Square, which has direct access to the N, Q, R, W, 4, 5, 6, and L subway train lines. There is a nearby bus station that serves the M1, M2, M3, and M55 lines. Are you looking for fast and effective facial treatments in the Flatiron District? Silver Mirror is here to help you with a complete collection of everything you need. To try out our services, please call ahead and book an appointment. All of our treatments will have you in-and-out in a New York minute. If you have any further questions about location or services, please don’t hesitate to contact us through the number provided or through the online booking form we have provided for you. If you’d like to know more about our spa and its methods, please check out this information about us.